Please click here to download the Winter Wonderland Ball poster. 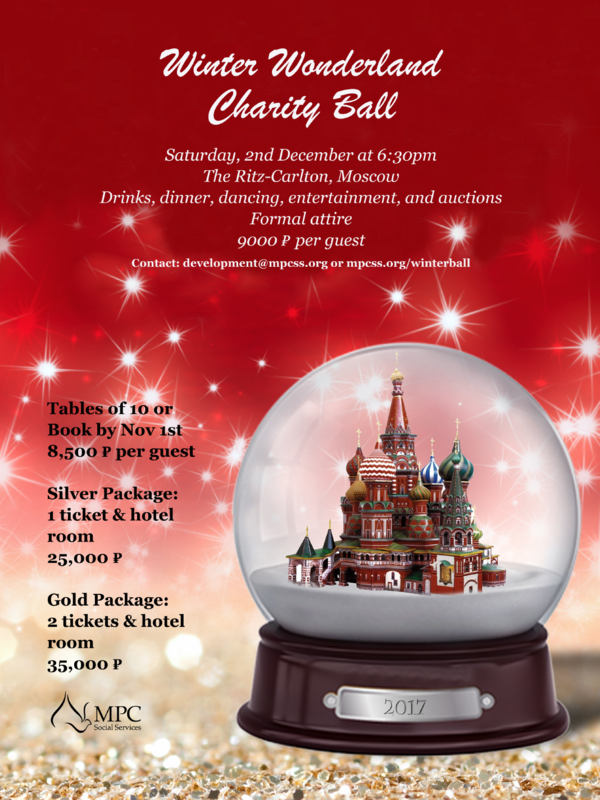 On Saturday, December 2 at The Ritz-Carlton Moscow, MPC Social Services will host its 9th annual Winter Wonderland Ball. The Winter Wonderland Ball celebrates and raises funds for MPC’s charitable work in Moscow. Our ball guests have an exclusive opportunity to stay at the Ritz-Carlton on December 2. Our 25,000 RUB Silver Package includes one ball ticket, hotel accommodation in a Superior Room, and breakfast. Our 35,000 RUB Gold Package includes two ball tickets, hotel accommodation in a Superior Room, and breakfast. This special room rate is less than half of the regular rate for this time of year. Please join us for an elegant evening of dinner, dancing, and fun. All proceeds directly benefit MPC’s innovative programs serving pensioners, refugees, immigrants, and low-income families. To learn more about MPC Social Services’ programs and events, please follow us on Instagram or Facebook. Customized sponsorship packages are available, including advertising recognition and other benefits. We welcome both cash and in-kind sponsorships. For more information, please email development@mpcss.org. Thanks to you, the Winter Wonderland Ball raised over $57,000. These funds have made a big difference to MPC’s charitable programs. We are deeply grateful to all of our guests, sponsors, and auction contributors for their support.